Vintage Tennessee Bicentennial Banjo — A unique music store in Brown County, Indiana! Instruments Guitars Banjos Mandolins Ukuleles Dulcimers And More!!! Check out our new special - "The Friday Feature"! Every Friday we will feature a new product and give you the opportunity to receive discounts and our lowest prices ever! New products are featured every week, so stay tuned to catch your favorite item here! Check out this very unique Tennesee Bicentennial Banjo with quite an interesting history! This bicentennial banjo was made in Nashville, Tennessee in 1975 by the legendary "Tut" Taylor and his Tut Taylor Music Company. Robert "Tut" Taylor was a huge part of Nashville, Tennessee's Americana and Bluegrass history as a world-renowned dobro player who used a distinctive flat-picking style in his playing. 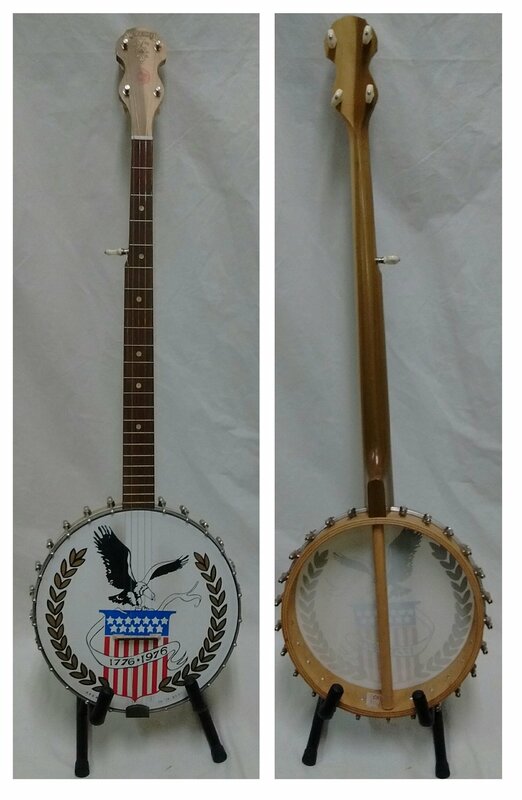 In 1975, the Tut Taylor Music Company was licensed by the American Revolution Bicentennial Administration to manufacture these handmade commemorative 5-string banjos. These instruments were available in both finished and kit form and were marketed throughout the country in honor of the Bicentennial Celebration. This is an incredibly unique piece of Bluegrass and Americana history, as well as a vintage commemorative piece of our Bicentennial history! This banjo features a nice, narrow profile Poplar neck and Commemorative Bicentennial Banjo head. It also includes a black Chipboard case. Take this banjo home as part of our Friday Feature Special today!